Automotive LiDAR Market size was estimated to be over 35,000 units with the market size of over USD 150 million in 2017. The market is anticipated to grow at a CAGR of over 40% during the forecast period. The automotive LiDAR market is propelled by the increasing research activities for the development of the autonomous vehicles. Over the past five years, autonomous vehicles have emerged as the most disruptive technology. The automotive manufacturers are evolving to cope up with the changing market dynamics and collaborating with the tech giants to achieve the goals of self-driving cars. The players such as General Motors, Waymo, Uber, and Apple are engaged in developing their own self-driving vehicles. These companies already started testing their self-driving vehicles on the roads and are looking forward to the mass-production for commercialization of such vehicles by 2020. As LiDAR is the key enabling factor in the autonomous vehicles, the mass production of autonomous vehicles is augmenting the demand for LiDAR sensors. A sudden surge in the demand for LiDAR sensors has been observed in the past couple of years. This has caught the LiDAR suppliers off guard. The customers have to wait over long durations due to the presence of a limited number of suppliers in the automotive LiDAR market. As a result, the existing suppliers must scale up their operations to keep up with the growing demand for this technology. The suppliers are establishing new manufacturing facilities and forming partnerships with other technology providers. For instance, in 2017, Velodyne established the automotive LiDAR mega factory in California to ramp up the production of its entire LiDAR product portfolio. The high costs and low durability of the existing LiDAR technology are the major factors plaguing the development of the automotive LiDAR market. This has driven most of the companies to avoid the technology altogether. The existing LiDAR technology uses mechanical LiDAR sensors on the roof. Most of these mechanical LiDAR sensors have a limited range and durability, which has made the automakers wary of investing in this technology. The mechanical LiDAR leads the automotive LiDAR market. The industry growth is credited to the growing demand for the mechanical LiDAR in the autonomous vehicles. It has been widely used in the self-vehicles due to its high accuracy and reliability in ADAS applications. These sensors are also integrated into the new functionalities such as 3D mapping and car-surround sensors. However, the expensive nature of the mechanical LiDAR technology has restricted its use in the semi-autonomous. The solid-state automotive LiDAR market is estimated to grow substantially during the projected period. The solid-state LiDAR technology is currently in the development phase and is not commercialized yet. However, the technology is gaining a lot of traction as it is cost-effective, faster, and provides high-quality data as compared to conventional LiDAR sensors. In addition, the companies are conducting various strategic initiatives to accelerate the innovation process in the solid-state LiDAR technology. The semi-autonomous vehicle segment held more than 40% of the total stake in the automotive LiDAR market in 2017. The industry is driven by the rapid integration of the advanced driving assistance systems into the vehicles. The LiDAR sensors have been used extensively in semi-autonomous vehicles to enable traffic adaptive cruise control & lane keeping. It enables the cruise control system to automatically handle the acceleration and braking functionalities without any human intervention. It also provides the lane keeping system with steering inputs to keep the vehicles within the lane. The autonomous vehicle market is projected to grow at a CAGR of approximately 35% during the forecast timeline. The swift development of the autonomous vehicles has developed numerous opportunities for the growth of the automotive LiDAR sensors. The sensors are being widely used in the autonomous vehicles to control braking, speeding, and safety systems in response to changes in the external environment. North America has dominated the automotive LiDAR market with over 70% of the total market share. The growth is driven by increasing research activities for the development of autonomous vehicles in the region. The supportive government policies related to the testing of autonomous vehicles and investments for driving the research activities by the government have also supported the market growth. For instance, in 2018, the U.S. government passed a spending bill, which provided USD 100 million to private institutions and government agencies to conduct researches in the self-driving technology. Asia Pacific will grow at a CAGR of over 60% during the projected timeline. 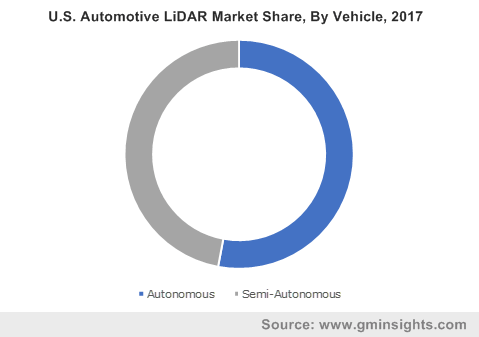 The automotive LiDAR market is mainly driven by research activities and investments in autonomous vehicles by the Chinese players. The favorable government initiatives in countries including China, Japan, and South Korea to commercialize the self-driving car are also estimated to augment the demand for LiDAR sensors in the region. For instance, in 2018, the Japanese government has announced plans to commercialize driverless car systems by 2022. 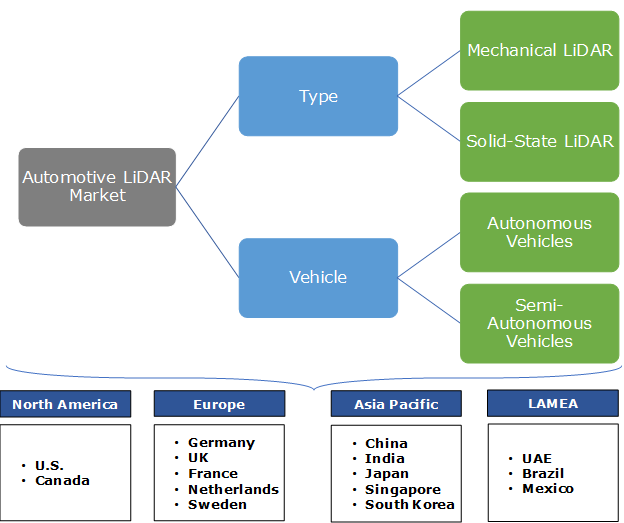 The major players in the automotive LiDAR market are Leddertech, Quanergy, Continental, Velodyne, Luminar Technologies, Innoviz Technologies, Aptiv, Magna, Uber, ZF, Blackmore Sensors and Analytics, Trilumia, Oryx Vision, Audi, BMW, Nissan, Mercedes-Benz, Tesla, and Volvo. The strong growth potential for the automotive LiDAR market has attracted new players toward the market. These new players are attracting robust investments from various automakers and financial firms to develop an innovative product portfolio. The companies in the automotive LiDAR market are forming partnerships with other LiDAR developers and conducting R&D activities to strengthen their product portfolio and to expand their market share. For instance, in 2017, Leddertech raised a funding round of USD 101 million led by Delphi, Osram Magneti Marelli & Integrated Device Technology to expand its R&D team, enhance its ASIC development efforts & accelerate its LiDAR development programs. Similarly, in 2018, Volvo partnered with a LiDAR start-up Luminar to work on both physical, car-mounted sensors and the software designed to process for the automotive LiDAR technology. LiDAR is a remote sensing technology that uses light pulses to detect sudden changes in its surrounding environment. It enables autonomous vehicles to travel smoothly & avoid collisions. In the past five years, automakers have embraced the LiDAR technology due to its increased performance and portability. They have used the technology to develop Advanced Driver Assistance Safety systems to visualize the changing environments that their automobiles are subjected to. However, a challenge restricting the growth of the automotive LiDAR market is the prohibitively expensive nature of the technology, which has prevented automakers from mass production using this technology. Historical data coverage: 2016 to 2017; Growth Projections: 2018 to 2024.